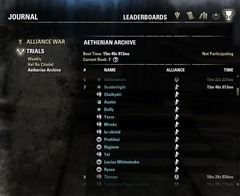 A guide to the ESO Aetherian Archive Trials in Craglorn introduced with patch 1.1. 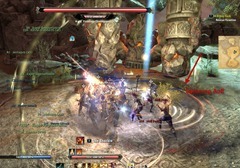 Aetherian Archive is one of the two 12 player trials introduced with Craglorn. It is on the very east side of Craglorn. There is no lockout for trials but you only get 36 rezzes for your entire trial death. Each death will add additional minutes to your trial timer. 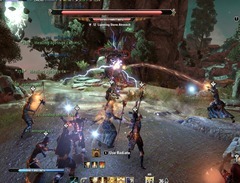 Once you run out of 36 rezzes, you have to zone out, disband your group, reform and retry all the way from the beginning. 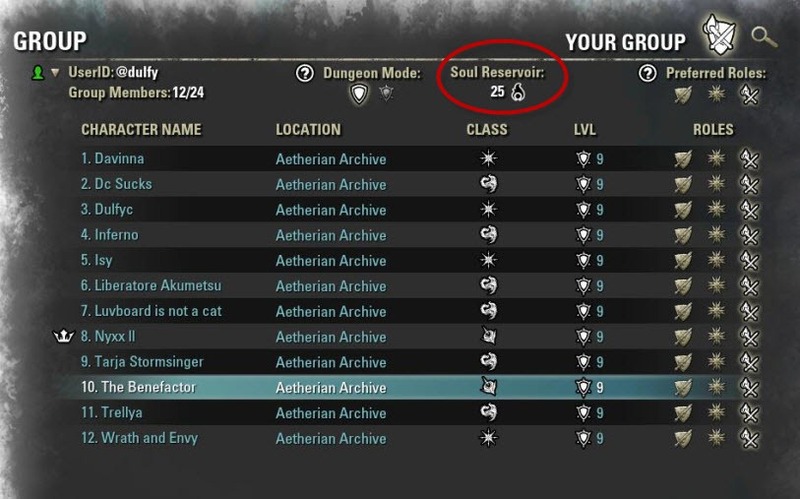 There is an option in the preferences to show soul reservoir which will tell you how many rezzes your trial team have left. You can also check it on your party window. 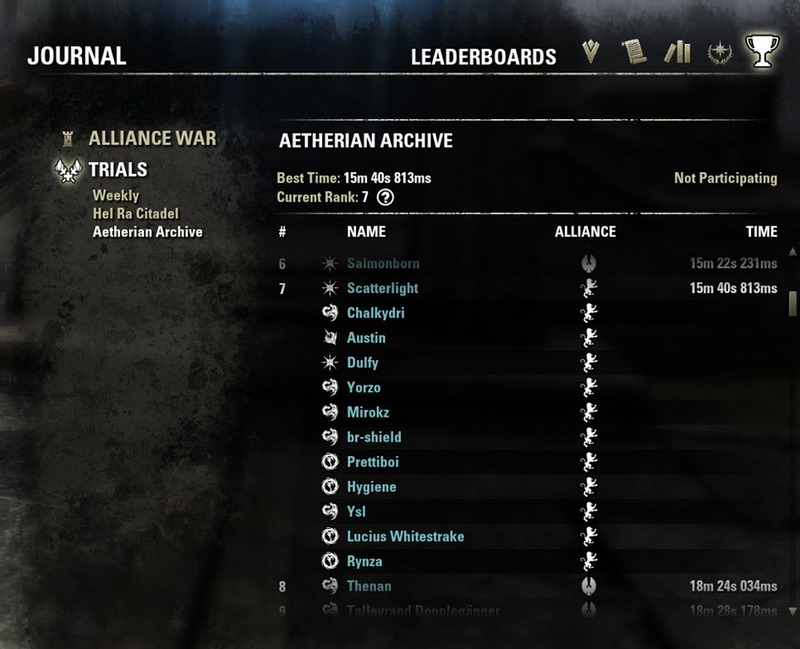 There is a leaderboard for completing the trial the fastest (access by pressing your journal key and then go to the last tab).. Keep in mind that since death adds lots of additional time to your completion timer, it is better to go safe than fast. You will need 3 healers and 1 tank that are at least VR10+. Bosses do not have a lot of fire/poison damage so Vampires/Werewolves are safe for this trial. You must have 12 players if you wish to progress beyond the first boss since there are stone levers that must be activated by 12 players simultaneously. Speedrun video of a clear at 15m and 40s. Includes all bosses and trash. Healing PoV. There is quite abit of trash before the first boss, Lightning Storm Atronach. 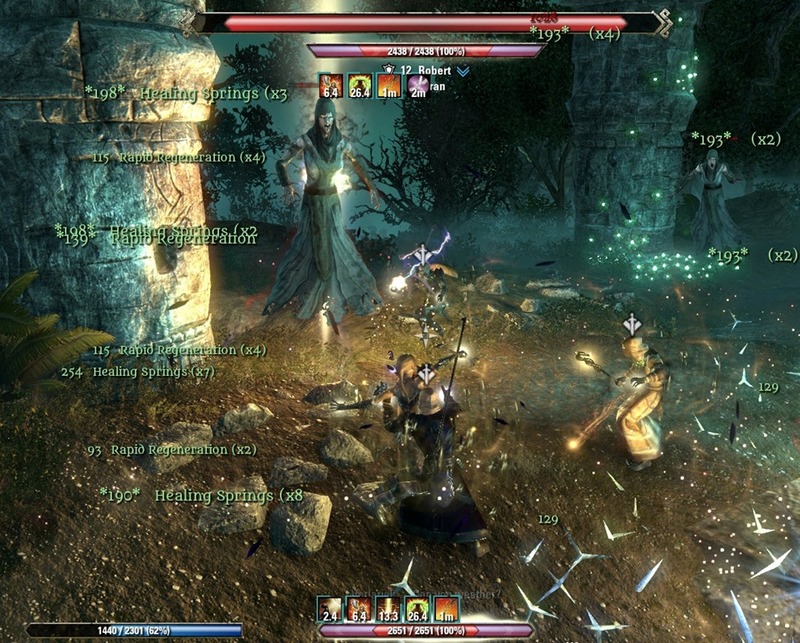 Inexperienced raid teams will wipe at these trash mobs and waste their rezzes. 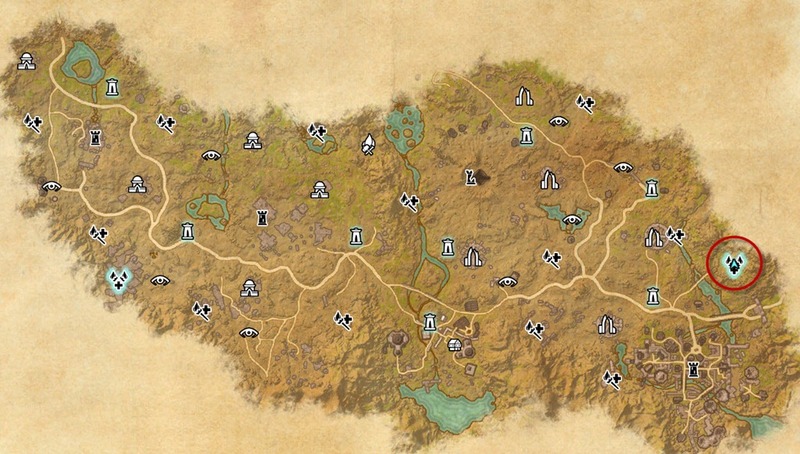 When you first zone in, you will be ported to the waiting area with a bunch of vendors and a quest giver. You can buy potions, soul gems, and repair your armor here. There is a door that will lead you further inside Aetherian Archive. Do not go through the door until your entire raid team is ready as doing so will start the trial timer. 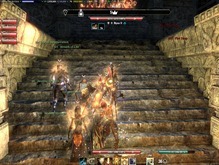 There is a group of 5-6 Flame Atronach on top of the stairs when you go through past the doors. Do not engage them immediately but rather wait for the rest of your raid team to catch up and move together. It is best to run past them and then Line of Sight (LOS) them by the bookselves so you don’t stand in their fire AoE (vampires beware). The next room is filled with moving ice that will freeze you. The best way to get past this room is via Rapid Maneuver under Alliance War –> Assault tree as this will make you immune to the ice. If you do get freezed by the ice, dodge roll to get out of it. Once you make it to the other side of the room, do not open the door until your whole raid is here as there are two Frost Antronach waiting past the door. The moment you open the door to the next room, two Frost Atronach will engage your raid group. Raid should be focused on one first (i.e. left) and focus DPS it down. Turn these atronachs away from the raid as they have a nasty frontal cone and avoid their red circle AoEs that can spike you. Once you make it past the Frost Atronachs and up the stairs with lightning, you will find a group of bannerman behind the next door. For these guys you can just mass AoE them and Volcanic rune from Mage’s Guild (morph of Fire Rune) really come in handy here to disrupt them. If you get a red circle under your feet, run away from the raid. 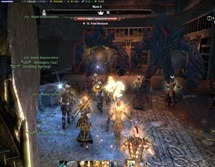 Lightning Storm Atronach is the first boss you will encounter in this trial and he is a rather easy one as long you pay attention. Impending Storm AoE pulse characteristic of other Storm Atronachs. Everyone should stay away and avoid the swirling circles. When he reaches his hand in the air, a yellow circle will appear in a random spot. Entire raid need to get in ASAP or they will get killed by his Lightning Strike attack. 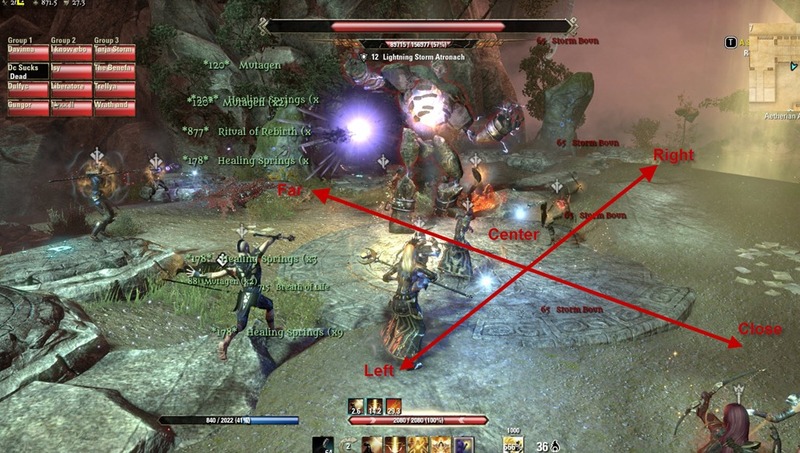 Raid leader need to call in/out and players should watch all sides of the room to call out where the yellow circle spawns. 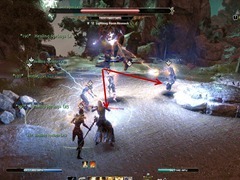 If you have fought Storm Atronach before, you will know their characteristic AoE pulse in which they will arch their back, lightning sparks will fly through their body and then they will unleash an AoE pulse (called Impending Storm here) with swirling circles going everywhere. 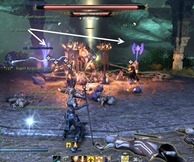 When this attack happens, the raid leader should call Out and everyone will need to stay away from the boss except for the tank tanking him. This will allow you to avoid the AoE pulse damage but you still need to watch out for the swirlies that is sent out as they can do serious damage and/or kill you. These swirling circles can be a bit hard to see but they are basically bright circles moving outwards from the boss. If you can’t avoid it, try blocking and hope that will reduce some of the damage. 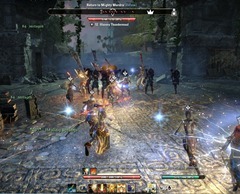 This Impending Storm pulse is the first attack that the Storm Atronach will perform so make sure that everyone stay out at first (except for the tank) until your raid leader tell you go to in. The other main mechanic of this fight is the Lightning Strike that the Atronach will call down. 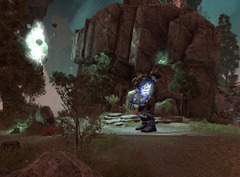 You need to watch the Atronach closely and when he raises his hand, this lightning strike will come down. To survive this lightning strike, you need to locate a yellow circle in the room which spawns in a random location. 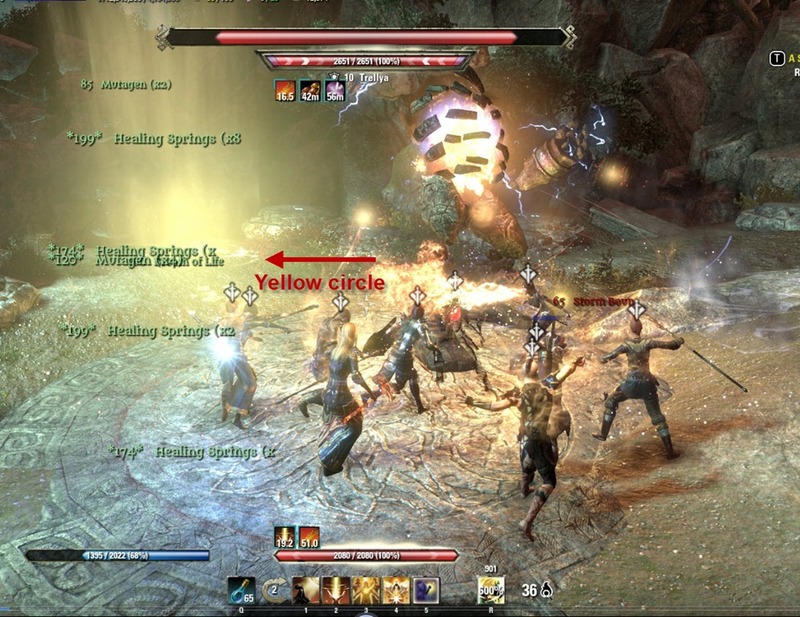 You only have a few seconds to get into this yellow circle before the lightning strike kills you. 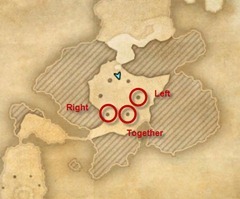 Therefore, it is essential you have someone in the raid callout where the yellow circle is if they see it. Compass do not work here due to the big boss healthbar so we designed an arbitrary system (far, close, center, left, right) to indicate the location of the yellow circle. Because this yellow circle spawns randomly, the entire raid need to stack in the center as that is the shortest distance to any potential yellow circle location. This is why you will hear raid leaders calling in/out where in is running to stack in the middle and out is moving away from the boss to avoid the AoE pulse. Since you don’t have a lot of time getting to the circle, considering dodging as that will move you faster. Make sure you sprint as well. Templars can drop their ultimate heal here to help those who are slower in getting into the circle. 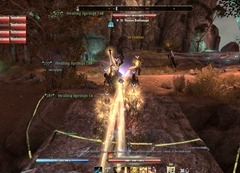 The Lighting Storm Atronach alternates between his Impending Storm AoE Pulse and Lightning Strike so you can predict exactly which attack is going to happen next. Once the Storm Atronach finishes his Lightning Strike attack, he will come running to the tank who is also inside the yellow circle so everyone else must move away from the tank and only stack back in center after the Impending Storm pulse. 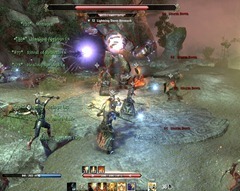 The Atronach also have a single target attack that can slow you. If this happens, call for a purify or you may have a hard time getting to the yellow circle. Templar healers should have Purify slotted in case this happens. Up to this point, you could have done everything with less than 12 players. However, if you wish to progress further, you will need to have exactly 12 players. 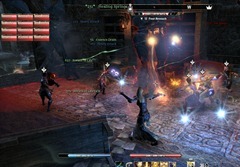 You will need to split your raid into 3 groups of four players. Each group will need to have a healer and ideally a tank. Once the groups are sorted, have everyone step on the 3 groups of stones and port to the next area. 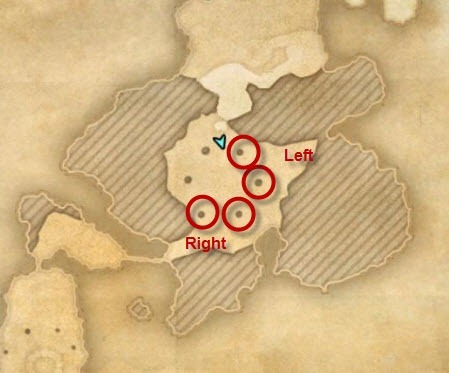 If the middle group have everyone sneak and back away once they get ported, they can avoid fighting the mobs in their area and just engage them after the left and right groups are done. This allow you to fight only one wave of mobs. Each group will get ported to a different area and will need to kill groups of adds. The side groups will finish first and go down to help the middle group. Make sure you kill the healers first and avoid the lightning attacks (Thunder Hammer) from the adds. Left group have a bunch of healers that need to be interrupted and a Chainspinner that pulls people in and have a nasty AoE. Tank should grab chainnspinner while the rest of the DPS + healer kill the healer mobs. Once everyone meet up on the middle and clear all the adds. It is time to step on 12 stone plates again to get ported to the next area, which is basically where the Lightning Storm Atronach was. The bridge to the next area will form but don’t cross the bridge yet as adds will spawn immmediately once you reach the other end of the bridge. For this next group of adds, you will want to kill Nullifiers first as they heal. 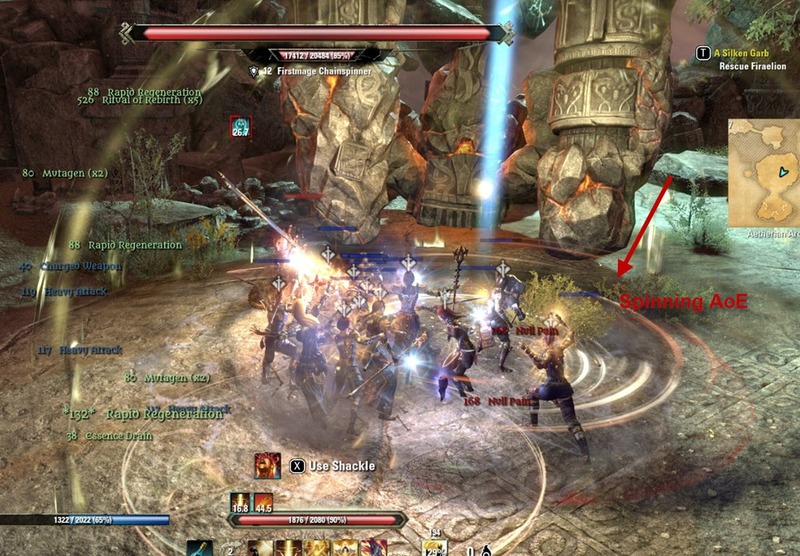 Avoid the AoEs dropped by the Chainspinners and if you get a red circle, move away from rest of the group. Deaths or even wipes can happen here if you don’t manage the adds well. 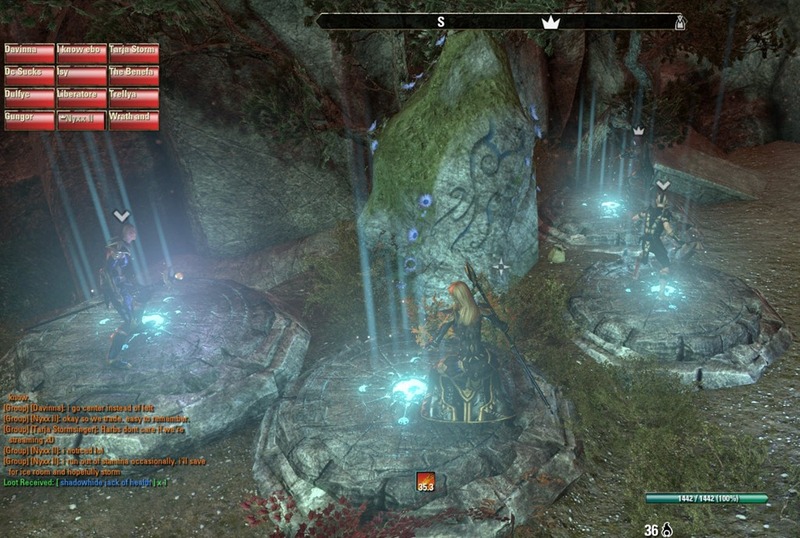 Once you cleared all the adds, it is time for the third set of stone plates that will take you to the next boss, Foundation Stone Atronach. Foundation Stone Atronach is a fight that test your raid’s healing and add management skills. 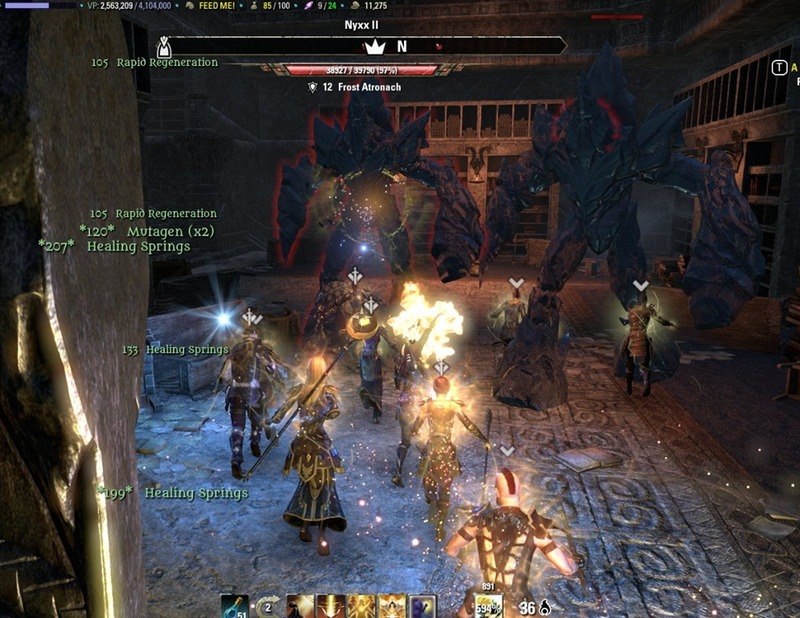 It is much harder than the Lightning Storm Atronach and not uncommon for raids to get stuck on him. Adds – Chainspinner adds drop AoE that wreck your raid so they need to be killed ASAP. Nullifier adds are lower priority but still need to be killed before too many accumulates. If you have a sorc or two, they can use Negate Magic to eliminate the the Chainspinner’s AoE and eliminate the need for the group to move out of it. 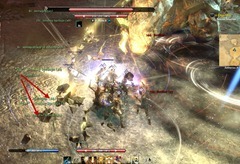 Dragonknight DPS with extended chains to pull the Chainspinner adds to the group and killing them. 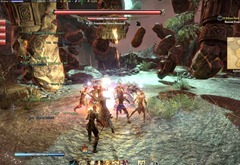 Sorcerers with Negate Magic to erase the Chainspinner’s AoE circles. One person that can keep a Siege Shield on the group at all times and another person with either Barrier ultimate or Circle of Protection from Fighter’s Guild. The entire raid must be stacked very tight together. This helps with healing the massive AoE damage and also the make avoiding AoEs from the adds much easier. 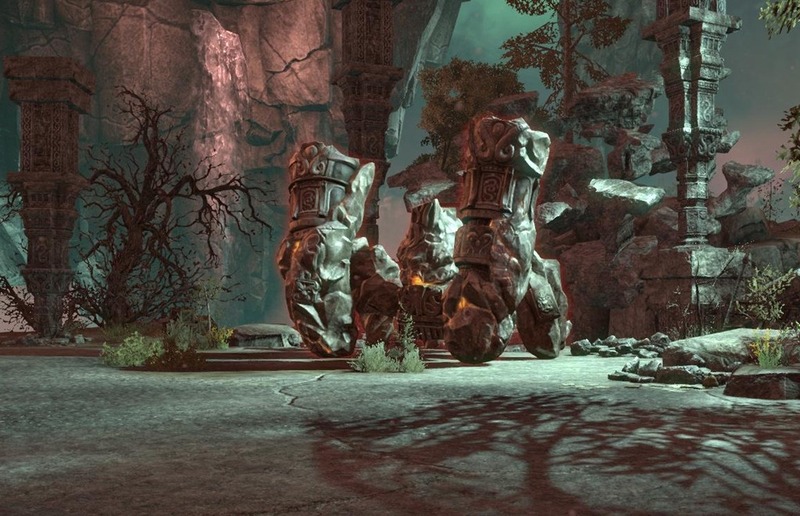 Big Quake is a massive raidwide AoE that occurs when the Stone Atronach stands up. His head will pound the ground 5 times over a span of ~6 seconds and healers will need to keep the raid alive during this mechanic. 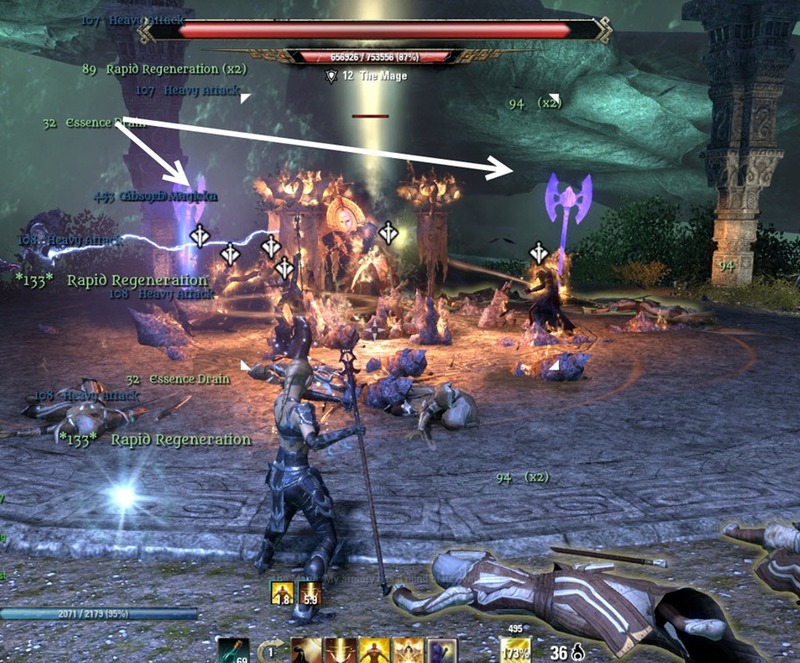 To deal with this massive raidwide damage, it would be ideal if you have at least two templar healers with their healing ultimate. 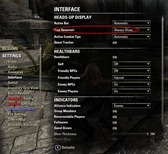 This allow you to have a templar healer using their ultimate for each Big Quake phase, greatly reducing the amount of healing that is needed. Bone Wall synergy from Undaunted line would also help but it is limited to 4 players. Barrier ultimate from Support tree of Alliance War is great since it adds about 1k HP to everyone. Circle of Protection from Fighter’s Guild can help as well, especially if you morph into Ring of Preservation. There are two types of adds that will spawn on this fight: Chainspinners and Nullifiers. Chainspinners is the more worrisome of the two as they drop a spinning AoE (Fury Unleashed) right on top of the right that can deal some serious damage when combined with Big Quake. 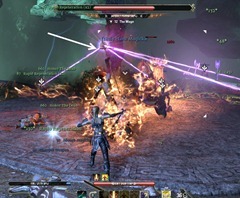 When this happens, we move the raid either to the left or right of the AoE circle around the boss and have a Dragonknight use the Extended Chains to pull Chainspinner to the group so he can be killed quickly. They only have 20k HP so they die rather fast as long the raid focus on them. You are basically moving in a circle around the boss and move whenever the spinning AoE is dropped on the raid. If you have a sorcerer in the group, they can drop their Negate Magic ultimate to “erase” the spinning AoE and eliminate the need for the group to move at all. Nullifier adds are less lethal as they do not drop any AoE but they will shoot at random raid members unless the tank picks them up. You don’t want to kill them as soon as they spawn but wait until you circle around to where they are and then AoE them down. Once the Stone Atronach is brought down to below 80-75%, he will start his Boulder attack between every other Big Quake. Some raid groups prefer to spread out to lessen the damage but Siege Shield skill from Alliance War will work in reducing the damage and allow the raid to remain stacked. 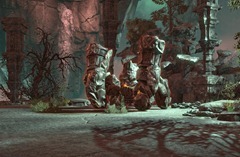 The “tell” for the rock attack is when the Atronach kneels on the ground and you see boulders form from the ground and lands on the raid. 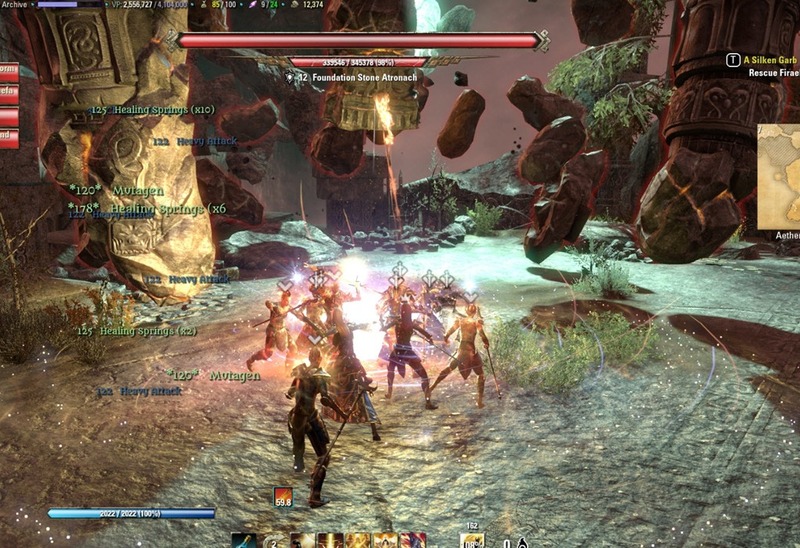 After you finish the fight with the Foundation Stone Atronach, your will need to split up again into 3 groups (same split as before would work). Left group need to kill the 3 menders on the cliffs before engaging the patrolling Chainspinner add. Doing so will also cause the nearby Nullifier add to attack. Middle group need to kill all but one mob and hold him there until the left and right group finish. Right group need to pull 1-2 bats at a time and not pull everything at once. This fight is a huge DPS race. If you do not have the DPS, this fight will be very difficult for you. Players need to avoid the AoE circles and not die to them as doing so will be a huge DPS loss. Red AoE circles on the ground constantly throughout the entire fight. If you do not avoid them, you could get killed instantly. At certain times during the fight, she will summon adds. The number of adds increase with each summon (i.e. 3 first time, 4 second time, 5 third time). You will need to kill them quick before she explodes as each add remaining alive increases her explosion damage. It is very hard to kill the adds when she summons 6 of them so you will just need to burn the boss at this point and ignore the adds. Expert Hunter from Fighter’s Guild works on this boss so DPS should be using it for increased DPS if possible. 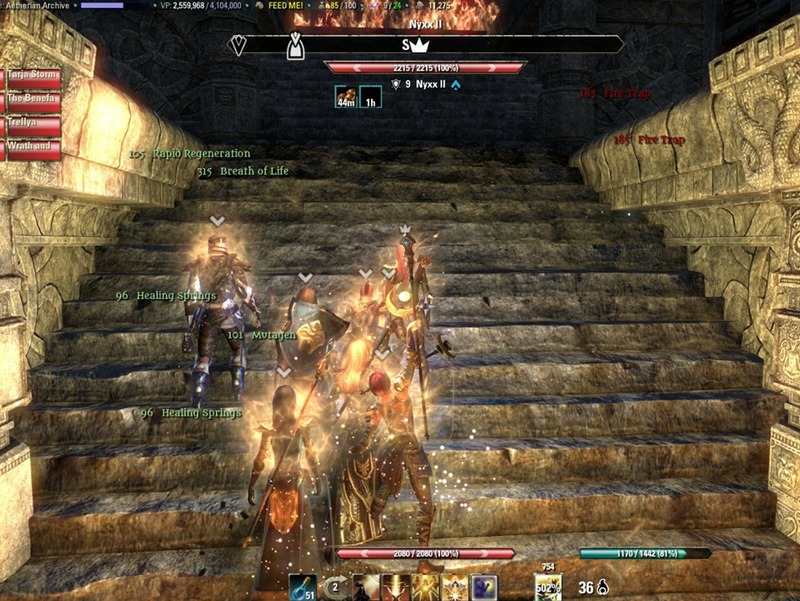 2 healers, 1 tank, rest all DPS parsing 700 + on single target fights. 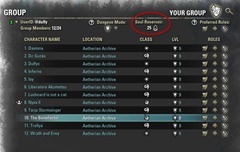 You will need to split your raid into 2 groups, with left group responsible for adds on the left side and right group for the adds on the right side. 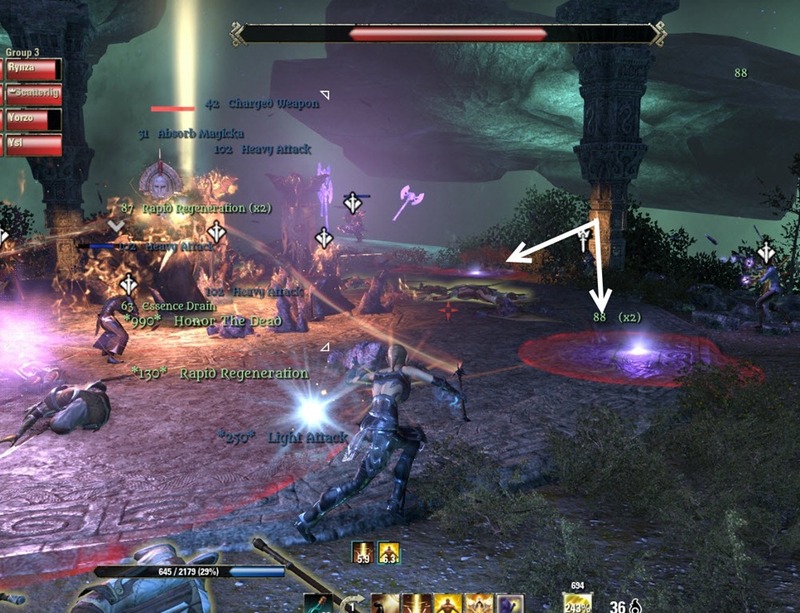 These red AoE circles will be constantly dropping on the ground throughout the fight. Once they hit the ground, they will expand to a slightly bigger circle. It is very important that players do not stand in them as they can get killed instantly by these “raindrops”, Having a death here could be disastrous due to the DPS loss. At certain time intervals during the fight, Varlariel will summon adds that are identical to her in appearance, each with 21591 HP. Each time this happens, the number of adds increase by one. The first add phase is always 3 adds. The next one is 4 adds, and the next one 5 adds etc. You can probably handle 3, 4, and 5 adds but 6 adds is just too much. Therefore, you want to ignore the 6 adds phase and hope that you can burn her down before then. Tank will need to have threat on the boss so that her autoattack (Frozen Breath) doesn’t kill other players during the add phase. 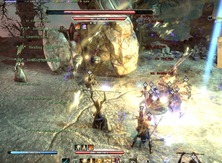 The adds always run to a pillar and there is a fixed pattern on which pillar they run to so you can always run to the spot before hand to get ready for maximal DPS. Left and right group each take one add and then converge to kill the middle add. Some raid groups like to leave one add up on this phase so they have more DPS time on the boss. This can work if you have everything close to 2.5k HP and have someone use Barrier ultimate from Support line of Alliance War to get around 3.5k HP. Left and right group each take two of the adds and kill them. This phase requires the highest DPS since you now have to kill 5 adds. If the boss is already at 150k when this phase starts you can probably ignore it and just burn the boss. Just burn the boss. 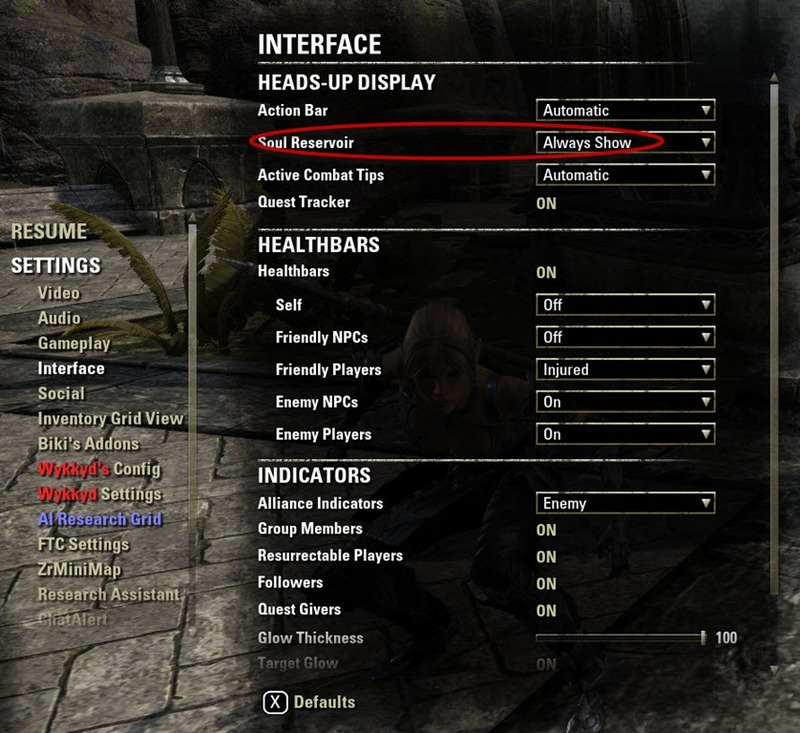 You won’t have enough DPS to kill all six adds. 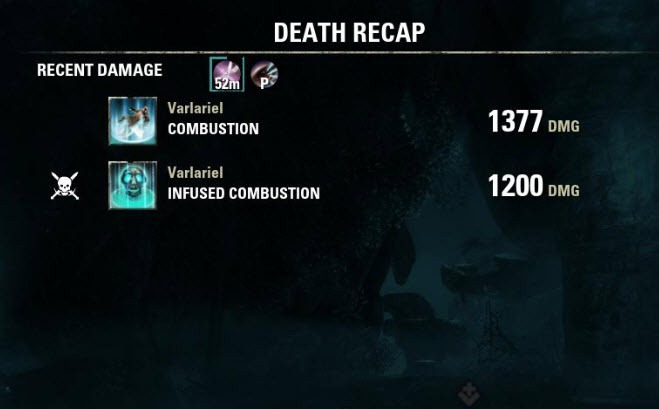 Combustion is a raidwide AoE explosion that Varlariel does after the end of every add phase. 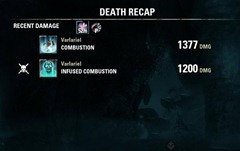 Normally this damage is survivable but if any adds are alive it adds to be damage (will show up as Infused Combustion in death recap). Putting down Circle of Protection, Barrier, Bone Shield etc will help survivability. 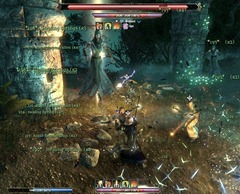 The Mage is the last boss of Aetherian Archives and has some insane DPS and healing check at the end. 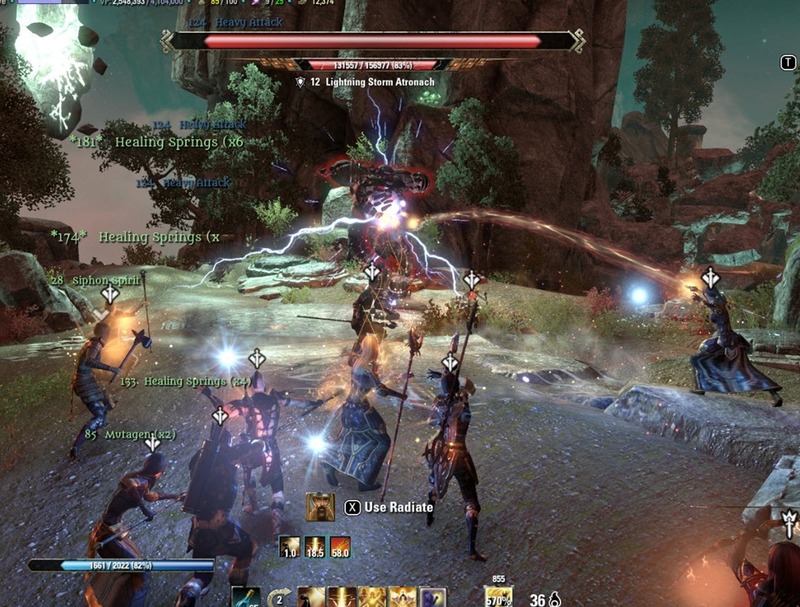 There are two groups of trash you have to clear before The Mage spawns immediately after you clear the second pack of trash so you may want to keep one mob alive to regen resources before engaging the mage. Chain Lightning attack at random players that also damage anyone standing nearby. Everyone need to spread out around the room at designated locations. 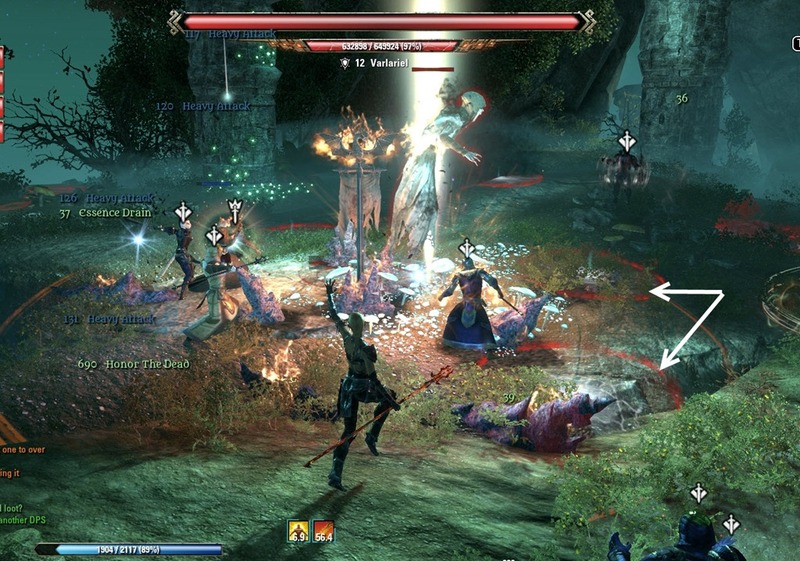 Daedric Corruption mines on the ground – avoid them. Summon Conjured Axes that need to be tanked so they do not damage rest of the raid. If the Axes do escape the tank, block their heavy attack or you might get one shot. Summon Conjured Reflection adds past 50% that need to be killed ASAP or they can do a lot of raidwide damage. At 30%, she transitions into another phase and start doing Arcane Vortex attack that deals raidwide damage that increases with time. This is a burn phase that requires massive healing as well. One person in the group should have Barrier ultimate from the support tree of Alliance War as it helps a lot with the sub 30% phase. 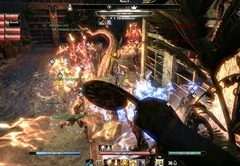 Chain Lightning attack is directed at random players in the raid. Anyone near you will also take “splash” damage. The raid need to spread out to minimize the amount of splash damage. This is especially important for melee DPS as they need to manage to DPS the mage without stacking on top of each other. 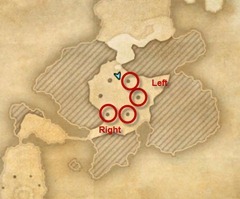 Healers should spread out in 3 points on the platform to so most players are within range of 2 healers at minimal. 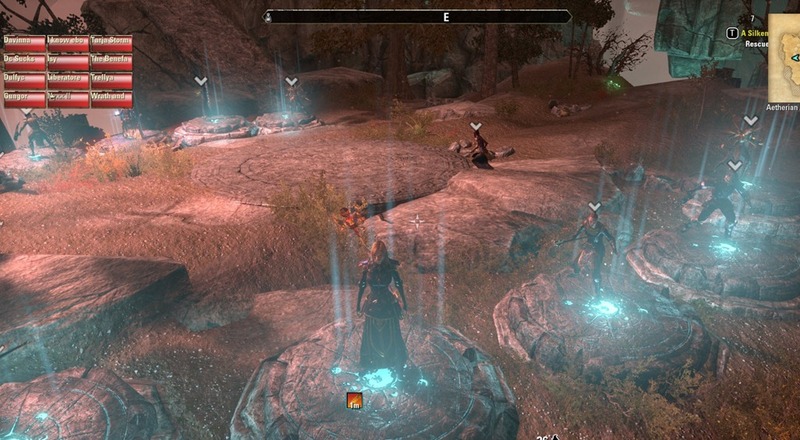 The Mage will also drop Daedric Corruption mines. They deal a ton of damage but they are fairly easy to avoid so no one should be hit by it. When the mage says “My armory has a mind of its own” or “I can’t stop my armory from growing” etc, she will spawn Conjured Axes (usually 2 at a time). Raid will not need to kill these axes but the tank will need to grab them away from the raid (our tank usually pick a corner on the platform to hold them). If the axe escapes the tank, whoever get attacked will need to be blocking their heavy attacks or they may risk getting one shot. The axes hit very hard so tanks will need to be holding down block constantly (make sure you have stamina pots). On the 30% burn phase when you need to run in, make sure you dodge into the middle as the axes do not disappear until the second knockdown and they can one shot you while you are knocked down from the first knockdown. Past 50%, a Conjured Reflection add will spawn and start doing an AoE attack called Consume Life which will hits a couple player in the raid and do a lot of damage. Healer will need to be ready to spam heals to counter this attack. This add need to be killed ASAP before it can dish out too much raid damage. You will probably get a second add to spawn before she does the 30% transition. If the Mage is close to 30%, you can probably just ignore the add and push the Mage down to 30% which will cause the add to disappear. Once she reaches 30% HP, she will does four consecutive knockdowns. Everyone will need to be running to the middle when the knockdown occurs and stack on top of her. Tank handling the axes will need to dodge roll into her to prevent getting one shot by the axes as they do not despawn immediately. 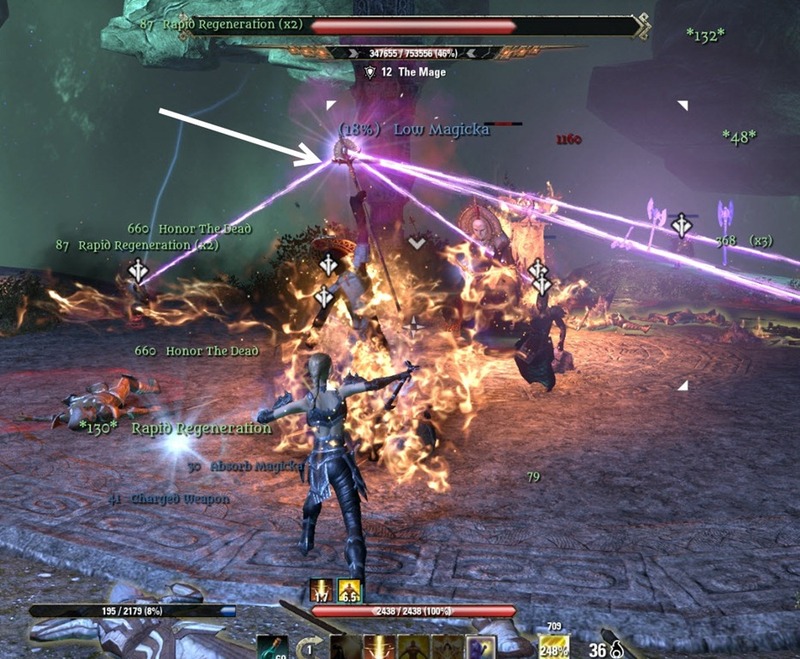 This 30% phase is a massive heal and DPS check as the Mage will spawn her AoE attack called Arcane Vortex that deals an enormous amount of damage. Barrier ultimate from support line of Alliance War will help greatly in reducing the raid wide damage (having 2 barriers will help greatly). 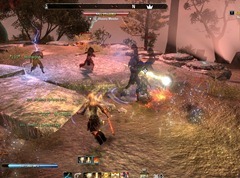 Templar healers can either drop their healing ultimate or Dawn’s Wrath Ultimate which reduce the AoE damage from the Mage by 30%. The healing at the start isn’t too bad but the damage will increase the longer she stays alive so you can regen your magicka for the first couple seconds of this phase and then just spam nonstop heals. Hey Dulfy, thanks for the guide. What do you think about other healers, i.e. Sorcs or Nightblades. 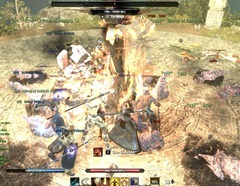 Do you think the resto staff + their unique skills is enough for a trial, or do you think all heal slots with templars is the way to go? 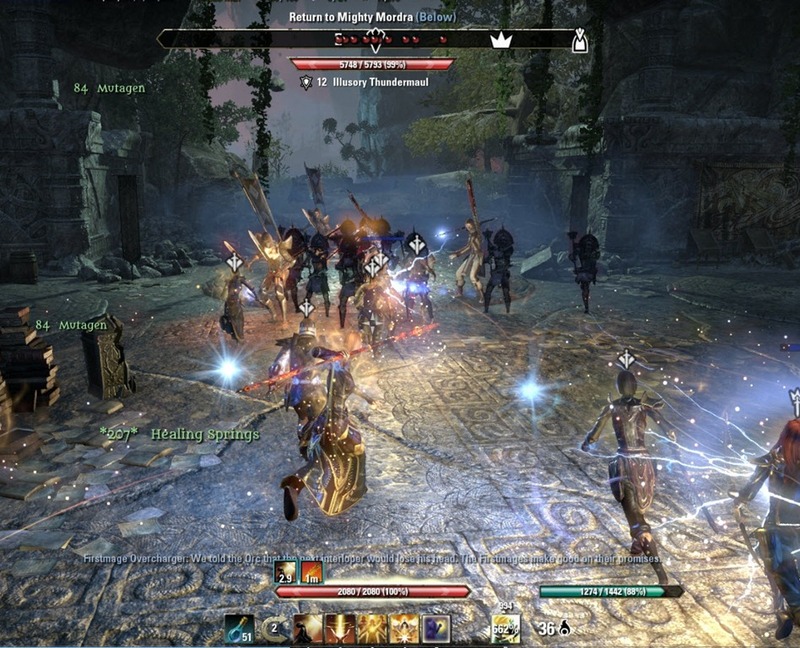 I am biased towards templar healers as their ultimate comes in very handy and most of successful trial runs were done with mostly templar healers. 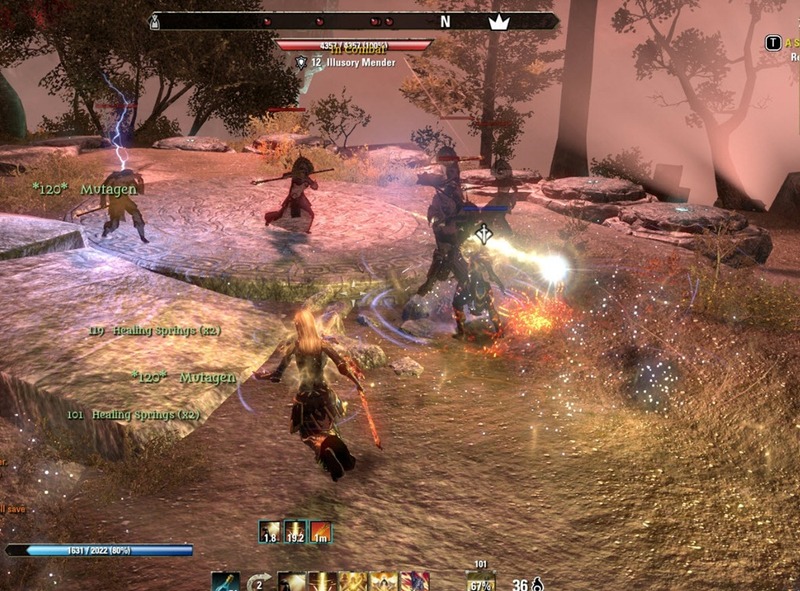 I think if you have main healers that are templars and then a NB/sorc backup healer it could work as well. I play a templar myself and love it. But I was just wondering, since it “should” be possible to do things with each class. What do you think about tanks? i mostly see Dragon Knight Tanks, but as a healer, I actually like every class to tank, with the right guy playing it. 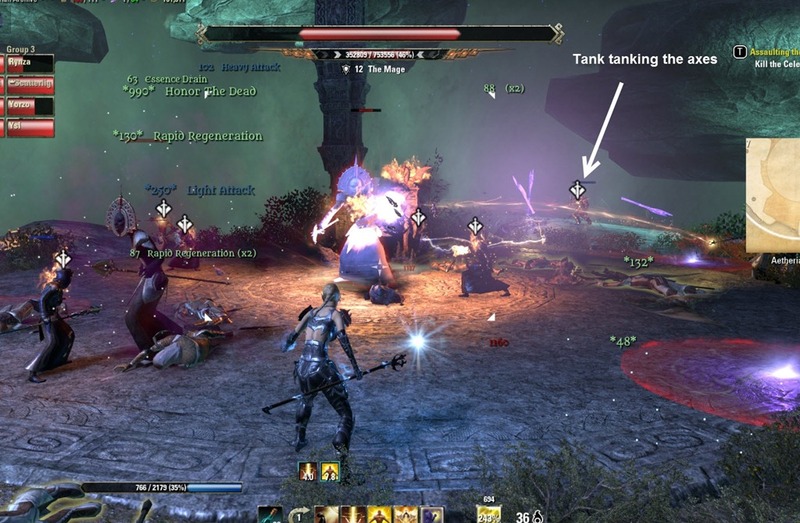 Im also sometimes tanking (only lvl 37 tough) with my templar and i think it works really well. I don’t think tanks are too class dependent. The chain pull on the DK tank is very helpful for the 2nd boss but other DKs can also do it for the tank if you don’t have a DK tank. In theory yes it is possible to do everything with any class. However, trials are not exactly easy content and if you want to min/max for the best chances of suceeding, certain classes do shine at certain roles. Sorc DPS for example are incredible and they can down trial bosses much quicker. Nice work as always dulfy ! i would just like to add one tip for handling the adds, always leave 1 alive and use the light armor skill annulment before combustion this will lower the dmg taken by 50% from it and you wont die if your at high hp before it goes of . this should help a lot of low dps raids gl ! I’m going to have to disagree with your comment about vampires being safe here (werewolves are fine, however).